The original desert boot was created in 1950 by Nathan Clark who got the idea from crepe-soled, rough suede boots which officers in the Eight Army were in the habit of getting made in the Bazaar in Cairo. 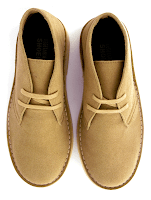 Now one of the largest footwear companies in the world, Clarks England is also one of the oldest. From its humble beginnings in 1825, in the tiny English village of Street, Somerset, to a global company that manufactures and markets close to 35 million pairs of shoes a year. 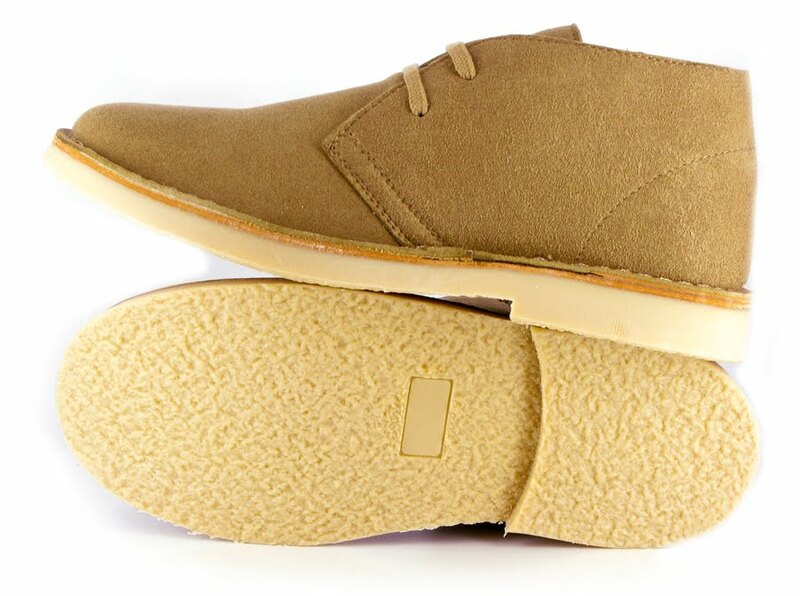 The Clarks Original desert boot has been reinvented by many designers such as Aquascutum, Common Projects and Pierre Hardy. 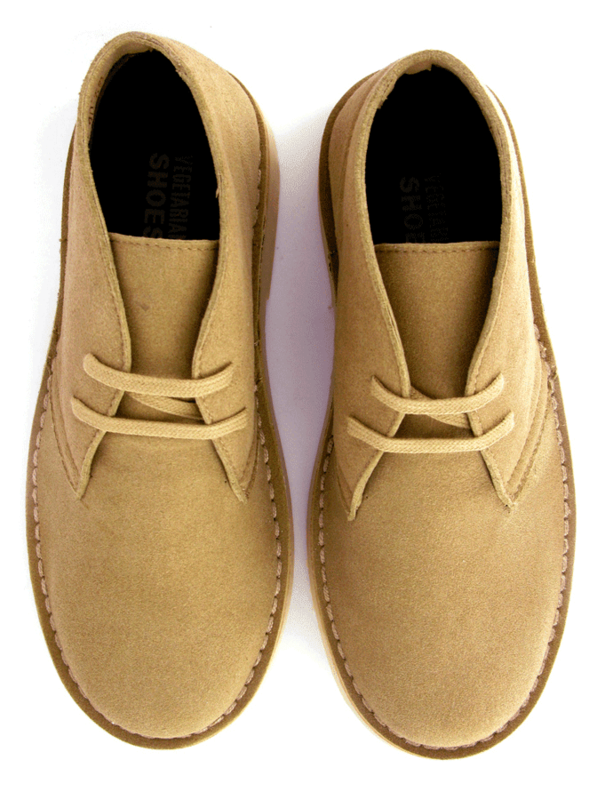 Its characteristics are soft, supple full grain leather uppers and a genuine plantation crepe outsole, and two eyelets. 60 long years after it made its début, the Desert Boot lives on. Its simplicity, its versatility and its individuality have all helped to secure its place on the roll-call of iconic designs. It’s a cult classic. Every man’s ideal shoe and one that would look great in your wardrobe. “Veggie Shoes first started in 1990. When I started the business back then, I made all the shoes by hand. In fact, originally I only made one style – a basic lace up shoe. I had started to teach myself to make shoes four years earlier after leaving Art College. I was inspired to hear that in parts of Africa, car tires were recycled into soles. This got me thinking and soon I was making shoes out of anything I could lay my hands on, but being veggie I didn’t want to use leather. Then I made an exciting discovery, -a synthetic Microfibre material used for yachting upholstery. It looked and felt like supple leather, but was ‘breathable’, unlike other plastics. After some experimenting, I realised that this was what I had been looking for, and Vegetarian Shoes was born. Nowadays, I no longer make shoes (which I do not miss, as it was blooming hard work !). Most of our shoes are made-to-order for us, exclusively to our specification in European and English factories, including the oldest co-op in the country, established in 1881. Vegetarian Shoes is still a small business, and we still operate out of our Gardner Street Shop and nearby office in Brighton, UK. We now send shoes all over the world and a growing number of stores carry a selected range”. 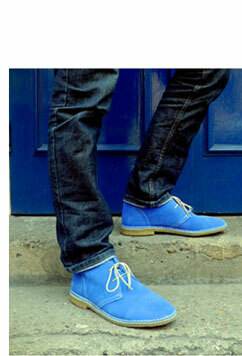 As part of Vegetarian Shoe new line, we find the the classic, casual, light-weight, lace-up desert boot. 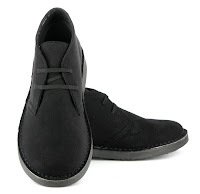 Made in super soft-to-touch breathable fake-suede microfiber. Utilitarian, practical and stylish. Insole is padded for foot comfort and perforated for moisture absorption/transmission in hot climates. Rugged, double thread stitch-down sole construction. Beautifully finished with corduroy rear and tongue lining and reinforced heel lining. It comes in sand, brown and black.